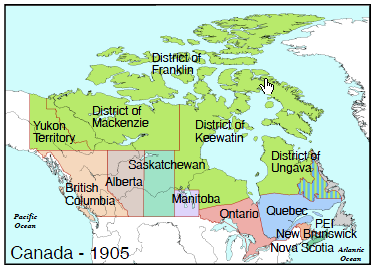 This is a map of Canada showing the provinces as they were at the time Alberta and Saskatchewan joined Confederation in 1905. Manitoba, Ontario and Quebec are smaller than they are today. Notice that Newfoundland (in grey to the far right) is still not part of Canada. It eventually joined in 1949 completing the sea-to-sea boundaries of the country. Until 1905 all the area west and north of Manitoba was called the Northwest Territories. It was a vast area that, for a long time, was home mostly to Indigenous peoples, Métis and fur traders from the Hudson's Bay Company. A few settlers were trickling in and a limited form of government was established in 1875. 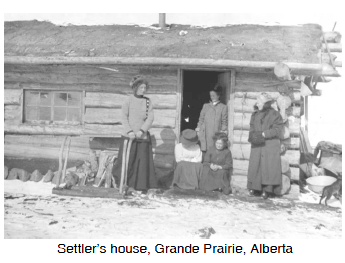 Since the turn of the century the Canadian government had been actively trying to encourage settlement in the territories particularly from new immigrants to Canada. Clifford Sifton, Minister of the Interior in Wilfrid Laurier's government, spearheaded the campaign to attract people from Europe and the United States to come and enjoy the opportunities offered by "the last best West." With the promise of 64 hectares of good farm land, the immigrants flowed in - Ukrainians, Mennonites, Hutterites, Doukhobors and Jewish farmers escaping the pogroms: organized attacks, especially against the Jews.pogroms of Russia. If the immigrants didn't always speak English, that was the language they wanted to learn, rather than French. In the early days of Territorial government, French, Roman Catholic education had equal status with English, Protestant schools, but over the years this had changed. By the time Alberta and Saskatchewan were to be created as official provinces in 1905, education was primarily in English. The Autonomy Bills creating the new provinces had a clause added to them that would bring back French Catholic schooling, but Sifton opposed the idea and resigned. Laurier decided to compromise by accepting Sifton's resignation, but letting him rewrite the clause anyway. The result was to anger Quebec while losing a strong voice for the west in Parliament - a loss on all sides for Laurier.